The listed links below will open up a new browser page or tab when clicked on. These links are divided into specific Health Service responsibility centers. Do I need to provide my son or daughter our prescription insurance card to fill a prescription at the SHS Pharmacy? Yes. We recommend that you provide your son or daughter with a copy of his/her insurance card. My son or daughter has an outside physician. Can he/she call/fax/e-prescribe a prescription to the SHS Pharmacy? Does my son or daughter have to use the SHS Pharmacy? Does the Pharmacy take our insurance? Most likely; we accept > 100 3rd party insurance companies. Call the Pharmacy at (412)383-1850 for further information. Can I transfer my child’s prescription to your Pharmacy? If so, how do I arrange this? Prescriptions can be transferred to the SHS Pharmacy. Call the Pharmacy at (412) 383-1850 for further information. Is there a waiver we can sign so we can speak with a doctor when she/he is sick? We require that your student give either verbal or written consent for us to speak to parents. HIPAA rules prevent SHS staff from discussing details without your student’s signed waiver for release of information. This process is NOT automatic and will only be performed at the specific request of the student. If my son or daughter needs to see a specialist, how do we go about getting a referral or finding a specialist? We maintain a complete list of specialists in the area, which is updated annually. Where and what are the procedures for allergy patients? Where should our allergist send documentation and serum? Any student wishing to receive allergy injections must schedule a nurse’s appointment at the Student Health Service by calling (412) 383-1800 and provide their serum, along with orders and instructions. Students will receive the Procedure and Guidelines for Allergy Patients and sign a consent acknowledging understanding of these guidelines. Serum and instructions can also be mailed to the Student Health Service. I am concerned about the care my son or daughter received at Student Health Service. Whom should I contact? My child has a specific health problem (e.g. Crohn’s disease). How will that be handled? Are your physicians familiar with this condition? Where should I send his or her medical records? Our clinic is staffed by board-certified physicians, licensed nurse practitioners, registered nurses, and medical assistants. The physicians include two internists, one pediatrician, who specializes in adolescent medicine, and two family practitioners. We recommend that your son or daughter schedule an appointment at the Student Health Service by calling (412) 383-1800 for an initial evaluation. If your son or daughter is in need of more specialized care, he or she can be referred to a specialist in the area. We recommend that outside medical records be sent to the Student Health Service for review by a clinician. Do you have doctors, or just nurses? Our clinic is staffed by five board-certified physicians, two licensed nurse practitioners, and one physician assistant. 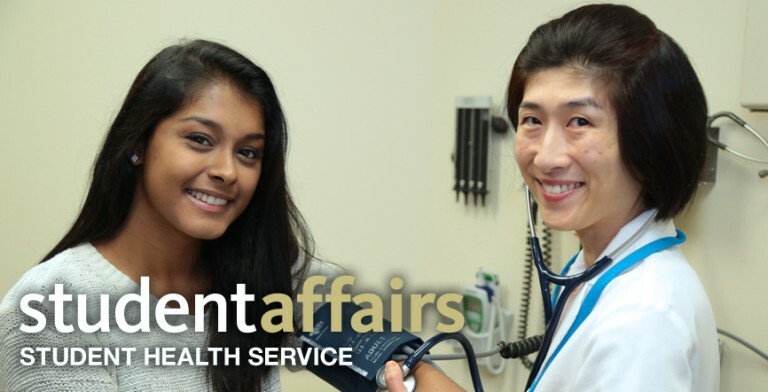 Additionally, registered nurses, medical assistants, a registered dietitian, health educators, and registered pharmacists are housed within the Student Health Service. During “Ortho Clinic,” we have orthopedic surgeons. During “PT Clinic,” we also have board-certified physical therapists. Can my son or daughter get an excuse or note from Student Health Service? No. We do NOT provide medical excuses. However, an invoice can be generated after a visit at the Student Health Service, which provides proof of the visit. This can be given to your student’s professor. Does the Wellness Fee replace medical insurance? No. We bill medical insurance for services provided. The Wellness Fee satisfies the co-pays and other ancillary services. We do not balance bills. Also, private health insurance is needed for hospitalizations, emergencies, outside referrals, and specialized imaging and other procedures (e.g. ultrasound, MRI and CT). All students should carry a copy of their insurance card with them at all times. What happens if my son or daughter gets sick when the Student Health Service is closed? If he/she lives in a residence hall, notify RA. Call the University of Pittsburgh Campus Police at(412) 624-2121. Go to the nearest emergency department (UPMCPUH across the street) or urgent care center. Due to the Federal HIPAA law, all medical records and health information for any student over the age of 18 are strictly confidential. Thus, disclosure of medical information to a parent or guardian without the written consent of the student is prohibited. However, should you be concerned, we will ask your son/daughter for permission to speak with you.